From slow-stalking humans to angry extraterrestrials, nothing gives us the shivers quite like a horror movie monster. But when you know what goes into making them—ping pong balls, for example—they get a little less scary. Or do they? Read on and find out. Other than his impressive ability to catch victims despite doing a slow shuffle at all times, what makes Michael Myers so scary is that perfectly emotionless mask he wears. The lack of expression makes him seem inhuman, which is almost a little insulting if you’re William Shatner. That’s because Myers’ mask is simply a Captain Kirk death mask created for use on Star Trek. The best part? William Shatner says he once wore a Michael Myers mask to take his grandchildren trick-or-treating. All puppets are creepy, but Jigsaw’s proxy, Billy the Puppet, is particularly sinister—especially given that he was made from nothing but household materials. The first Saw film had a budget of just over $1 million, so director James Wan pinched a few pennies by handcrafting Billy out of papier mâché. His eyes were black ping pong balls and his body was paper towel tubes. Scream’s iconic serial killer could have gone a different direction if it wasn’t for an accidental discovery. Producer Marianne Maddalena was out scouting old homes to use for the house party scene at the end of the movie. 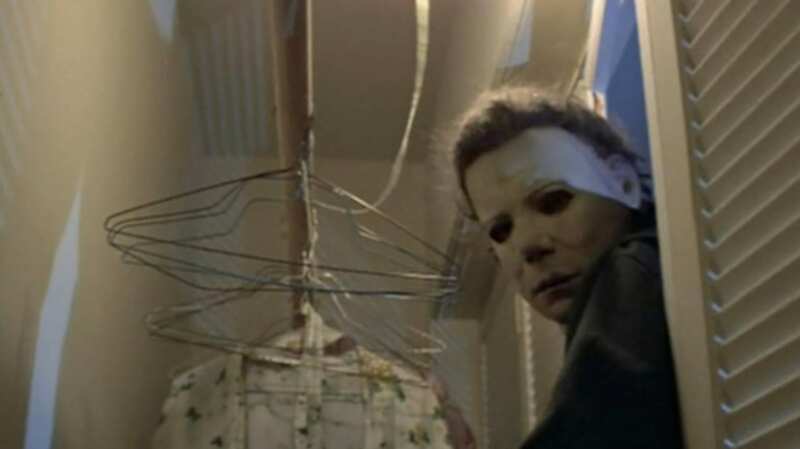 Though she nixed an abandoned home once used in Hitchcock’s Shadow of a Doubt, Maddalena came across an old Halloween mask while she was there. Inspired, she brought the mask to Wes Craven, who loved it. Unfortunately, the design belonged to a company called Fun World—they called it “The Peanut-Eyed Ghost” mask—and they wanted a lot of money for its use in the film. The company relented when Craven and his team made something similar and threatened to move on without the now-classic mask. That creepy, muzzle-like mask that Anthony Hopkins wears while he’s being restrained as Dr. Hannibal Lecter? Totally just a goalie mask. According to sculptor and custom goalie mask maker Ed Cubberly, he received a call from costume designer Colleen Atwood asking him to come up with something that would be appropriate for use on “a schizophrenic who goes around biting people.” Cubberly flipped a goalie mask cage upside down and then shaped it, adding bars over the mouth to make it look mean. “In a matter of about five minutes, the concept was born and sketches ... were in the mail,” Cubberly says on his website. Hannibal Lecter isn't the only villain to don a hockey mask, of course. Jason Voorhees is the most famous villain to suit up NHL-style, but he didn’t actually do it until the third movie in the series. Prior to that, Jason simply wore a burlap bag over his head to conceal his face. When the production crew was doing lighting checks for Friday the 13th Part III, however, Martin Jay Sadoff—the film’s 3-D supervisor and an avid hockey fan—offered up a fiberglass Detroit Red Wings goalie mask to help assess lights and shadows. Everyone loved the mask so much that they changed Jason's look and decided to keep the stand-in. If we were being literal, Lon Chaney Jr.’s classic character would have been called The Yak Man instead of The Wolf Man. To play the title role, Chaney spent hours in the makeup chair getting rows of yak hair glued onto his face. The fur took six hours to apply and three to remove. Chucky from the Child’s Play movies may actually get scarier when you see what he looks like without skin. If skinless dolls don’t bother you, check out this video on how Chucky came to be: It took nine different animatronic dolls to achieve the various movements needed to make the movie.